Can India Overtake the USA? India is a third world country wrapped in bureaucracy and red tape. These are the two strings that keep pulling India back into the puddle of stagnation and poverty. Keeping these things aside India possesses all the characteristics to become a great and dynamic part of the one world God created. 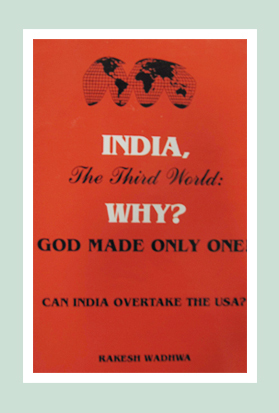 In this book it is stated that India does possess the ability to overtake the United States leading to wealth for all. This is a long term process and this goal cannot be achieved overnight. A strategy should be kept in mind and the entire nation should work towards it if India is to be saved. For this the author has suggested that capitalism should be adopted as no country can prosper without it. The book explains the importance of a free market in which there are no controls and regulations only a free will to prosper and step into the future which is definitely much brighter. India, the third world is a futuristic vision. A need is felt to forget Nehru’s socialism and move boldly, decisively and immediately into the next century. Casting aside stultified and tired ideology and India will regain the glory of bygone era when it was known as the ‘Golden Bird’. Read the complete book here. Rakesh Wadhwa with Leon Louw wrote ‘The Deal maker’ which is the journey of a boy Sudesh from a small village in India to the highest political office. Sudesh Kumar is an honest policeman’s son who lives in a village near Delhi. He dreams of becoming the prime minister of the country and thereby bringing in reforms which will benefit the rich as well as the poor. His life takes an ugly turn when his father dies due to negligence of the staff of a government hospital. Following a sequence of events Sudesh joins a multinational company headed by a supporter of objectivism and free markets. It is here that Sudesh learns about libertarianism along with various other aspects of business and investments. The novel takes readers through the journey of the protagonist making them understand various aspects of the society they live in and the policies that are being followed by governments. Although it is a fictional story it aptly describes the political and economic situation in India. The novel makes its readers stand up and take notice of the conditions in which they live. It advocates the importance of democracy and freedom. The book is about India getting rid of shackles relegating its people to penury. It is a tale of a man who becomes the prime minister of the country not because he wants to be someone but because he wants to bring about an element of change in the country. He takes it upon himself to become the deal maker who transforms his country into becoming the golden bird which it once was.